Ho Chi Minh City, Cu Chi Tunnels, My Tho, Cai Be, Vinh Long, Ben Tre, Ho Chi Minh City. Come and share our passion for this beautiful destination. 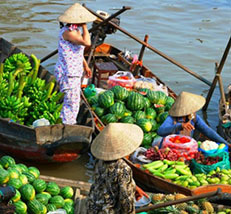 Experience the dynamic atmosphere of Ho Chi Minh City, the tranquil backwaters of the Mekong Delta staying in our delightful homestay and immersing ourselves in the timeless rural and riverside life as we travel by all manner of boats, bicycles and cars through this remarkable region. Come and join us! Upon your arrival and transfer to your hotel. No activities are planned today. We depart from Ho Chi Minh City and drive to Cu Chi district. 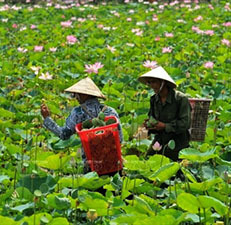 Here, we wander around its surroundings and villages and spend time interacting with the local people before we visit the incredible tunnels which stretch over 250km from Saigon to the Cambodian border. At the height of its existence, the tunnel system was three levels deep. Then we return to Ho Chi Minh City. The remainder of the day is to take a tour around the city, formerly called Saigon, visiting the History Museum, the Binh Tay Market in Chinatown and the Reunification Palace. We have plenty of free time to enjoy the city. (Breakfast, lunch and dinner are included). 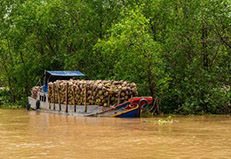 Explore the fertile, lush flood plains of the Mekong Delta by boat, at a pace and in a manner that brings us close to the people and the way they live. 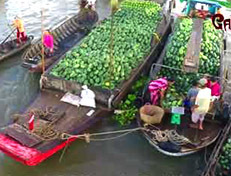 Experience the beauty and complexity of the many waterways that interlace the scenic landscape and the human activities dependent on both water and land - several types of farming, fruit orchards, floating markets, and several villages. We drive out of Ho Chi Minh City to Cai Be, stopping en route at My Tho. 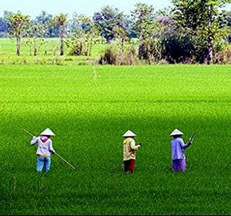 Here, we can witness rural scenes of farmers seeding, ploughing, and harvesting the rice crop. 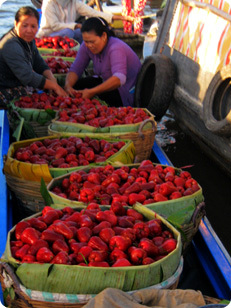 Next, we arrive at the market of Cai Lay, a fascinating little market nestled on Cai Lay's river bank. 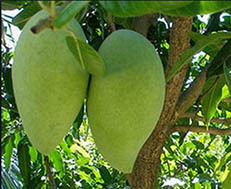 We take a leisurely walk through the market and sample some local fruit. 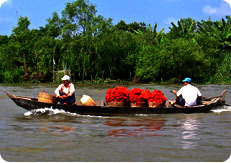 At the floating market of Cai Be, we discover further into the delta through small villages as we enjoy a boat trip up the river. It is a beautiful way to spend our afternoon. We spend the night on a boat. (Breakfast, lunch and dinner are included). 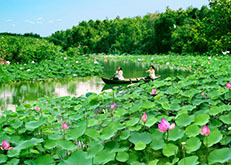 The Mekong Delta with its wealth of waterways and small islands is naturally a good hiding place. 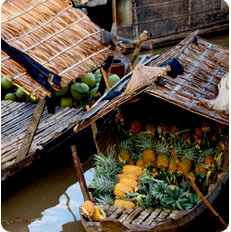 We embark on a river boat in the morning to the colourful Cai Be floating market. 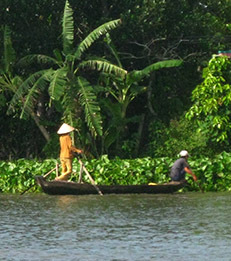 We then make our way through Vietnam's largest river. 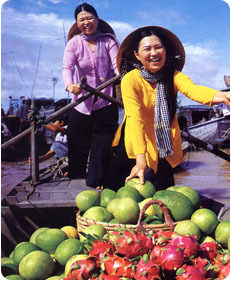 We navigate along Tien River, exploring tributaries and appreciating the warmth of local people along the river's banks as we travel. 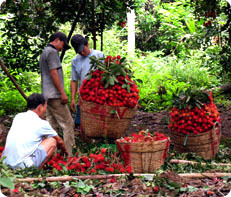 Arriving in Vinh Long, we visit a beautiful local market or just enjoy the region's laidback atmosphere. (Breakfast, lunch and dinner are included). 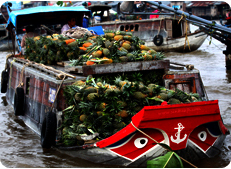 Today our destination is Ben Tre province. 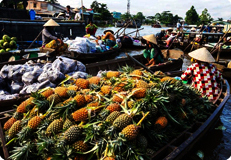 Ben Tre is located in an intricate network of waterways interspersed with patches of cultivated land which are home to a labyrinth of fruit orchards, rivers and a former stronghold of Viet Cong during the Vietnam War. This provides the best way to learn the way of life in the delta. 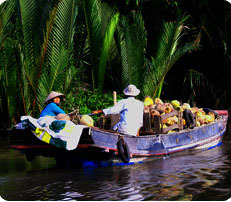 We combine a boat ride on Ham Luong River in Ben Tre and a walk through giant flower nurseries and orchards. 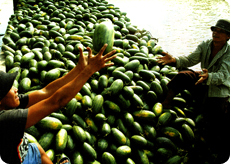 En route, we enjoy local people's gracious hospitality as they share the delta's succulent crops with us. There is plenty of time for us to learn about horticulture. We settle in with a very hospitable and friendly local family to observe the various steps required to tender bonsai trees and their extensive crops. The night is spent with them. (Breakfast, lunch and dinner are included). 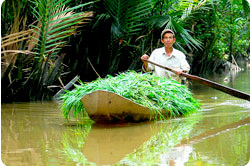 On this day we will take an unusual foray into the rural life and spirit of the delta in Ben Tre province. Cycling is one of the ideal ways to explore the miles and miles of vivid, lush, and verdant orchards stretched along the shores of river tributaries and enjoy welcoming countryside. We set off by bicycle along the riverfront, down tiny lanes and through rural villages, providing a wonderful opportunity to meet the local people. This is followed by our journey back to Ho Chi Minh City, arriving there at around 5pm. (Breakfast and lunch are included). You can depart at any time today. (Breakfast is included). - a 2-5 km walk on Day 3. - a 3-4 km walk on Day 4. - a 4-6 km on Day 5. 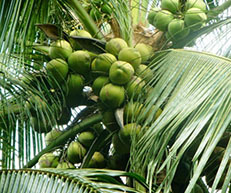 - an 8-12 bicycle ride on Day 6. 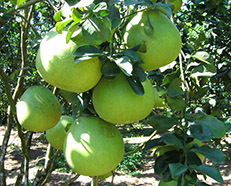 We choose local ingredients, typical of the way people eat in the area, at homes, local restaurants or markets. 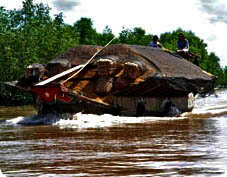 - overnight boat (1 night). 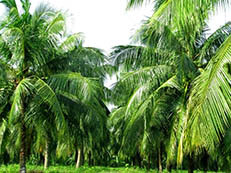 - $609USD per person for a group of 2 to 6 people. - $ 565USD per person for a group of 7 to 8 people. Pack essentials including light comfortable clothes suitable for outdoor activities. Take a small day pack for cycling and walking.